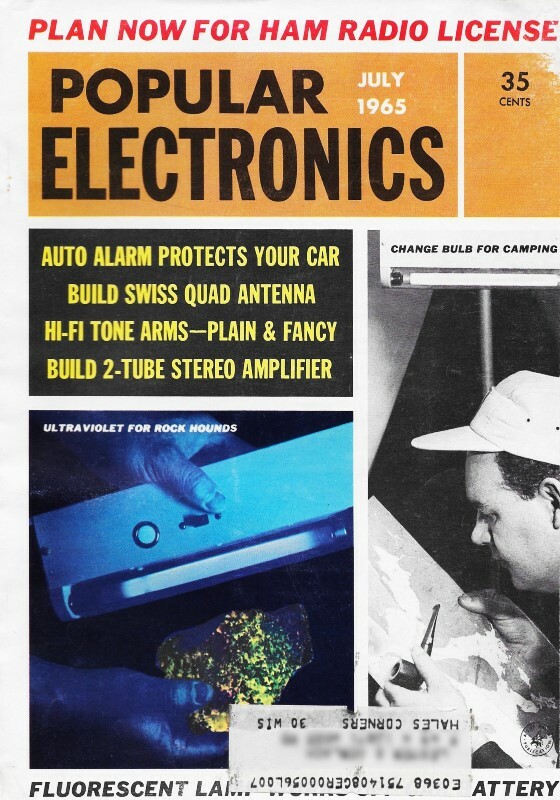 Here is another article from a vintage issue of Popular Electronics magazine that I am posting for the benefit of Hams who happen to be searching for information on Swiss quad antennas. As with most topics, there are many sources on the Worldwide Web (when's the last time you heard the Internet referred to as the WWW?) covering how to build and tune Swiss quad antennas, but this one might have just the right slant on things that the reader is looking for. It probably is not of great interest to most visitors, but having it appear on the RF Cafe homepage guarantees that Google, Bing, and other major search engines will pick it up within hours. Thanks for your indulgence. All-metal, 2-meter cubical quad uses new ideas proposed by HB9CV, front-to-back and front-to-side ratios are over 25 db. Although the "Cubical Quad" directional antenna has several obvious advantages, including high gain and economy of construction, the mechanical strength to cope with high winds is not an outstanding feature of the Quad constructed of bamboo and wire. The all-metal "Swiss Quad" described in "Across the Ham Bands" in the April, 1965, issue of Popular Electronics (page 74) has generated great interest among the ham fraternity. The Swiss Quad retains the electrical advantages of the usual Quad, but adds strength and durability. A 144-mc. 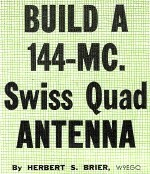 Swiss Quad can be built in a few hours at a cost of less than $4.00. It will give a real hop to your signals. Design. If the centers of the horizontal members of a two-element Quad are pushed in until they touch, they may be joined - both electrically and mechanically-to the central support pipe. If the horizontal members are metal tubing, the Quad becomes a self-supporting struc­ture without an auxiliary framework. You can build a Swiss Quad in a few hours using readily available copper wire and tubing. The mast can be any convenient length. Sweat elements to the support pole with a heavy soldering iron or butane torch. Coupling the centers of the horizontal members of the Quad together and to the support pipe is permissible, because these points are at zero r.f. potential. 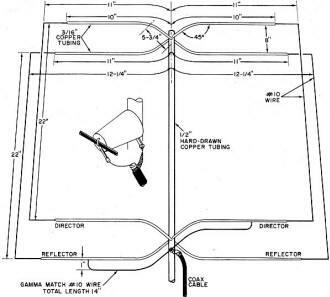 But, because a portion of the elements are partially bent back upon themselves, the overall dimensions of the antenna should be approximately 10% greater than for a conventional Quad cut for the same frequency. The designer of the Swiss Quad, Rudolf Baumgartner, HB9CV, accommodated this increased size by adding to both the horizontal and vertical dimensions. I have found, however, that there is no significant difference in results if either the horizontal or vertical dimensions are kept the same as in a conventional Quad, and the other dimensions are increased sufficiently to restore resonance at the desired frequency. Construction. The 144-mc. Swiss Quad is made of copper wire and tubing which is available in hardware and plumbing supply houses. To build a duplicate of my Swiss Quad, first straighten the 3/16" copper tubing by rolling it on a flat surface while tapping it lightly with a wooden mallet. Cut off four 21" lengths. Now take the hard-drawn 1/2"-diameter copper tubing and drill a 13/64" hole a half inch from the top end. Line up the drill so that the bit passes through the diameter of the tubing and comes out on the opposite wall. Drill another pair of 13/64" holes 22" below the first pair in the same manner. Then rotate the tubing a quarter turn, and drill a third pair of 13/64" holes 3/4" from the top end and at right angles to the first pair; and drill a fourth pair 22" below the third pair. Finally, drill a 9/64" hole a half inch below the bottom 13/64" hole and in line with the first and second pairs. Mount the standoff insulator in the 9/64" hole on the supporting rod. Place a solder lug under and on top of the insulator. You may have to do a bit of juggling to line up the screw through the 9/64" hole from the inside to catch the insulator, but it can be done. Slide the four pieces of 3/16" tubing through the 13/64" holes, and position them so that they all extend 10" from the center of the 1/2" supporting rod to one side and 11" from the center to the other side. Solder them in place, using a husky soldering iron (250 watts or larger) or a small torch. Measure 5 3/4" from the center of the supporting rod along the 3/16" tubing,· and bend the 3/16" tubing horizontally 45° so that the end sections of each adjacent 10" and 11" length are parallel and spaced eight inches apart. It is not necessary that the bends be sharp; slightly rounded corners are preferred. Remove the plastic insulation from a 14" length of #10 wire which serves as the gamma matching rod. The rod is approximately 12" long and soldered at each end to the radiating elements; it is spaced an inch away from the elements. Do not solder the ends of the gamma rod until you have had an opportunity to adjust it, as described below. Cinch the solder lug on top of the standoff insulator around the center of the gamma rod, and solder it and the center conductor of the 50-ohm (nominal) coaxial feed line to the gamma rod. Solder the cable shield to the other solder lug. Slice the insulation off the remainder of the #10 wire, and cut four 30" lengths. Four inches from each end of these lengths, bend the wire at right angles to form shallow U's 22" wide. Slip the ends of these U's into the corresponding top and bottom 3/16" copper tubing to the dimensions shown in the drawing. Adjustment. Place an SWR bridge in the coax line and feed a small amount of r.f. into the line. Slide the wire U's in and out to obtain the lowest possible SWR. Move the U's no more than a quarter inch at a time, and keep the ratio between the "director" and "reflector" dimensions constant. After the SWR is reduced to a minimum by adjusting the U's, vary the length of the gamma for a possible further reduction in SWR. It should be a simple matter to reduce the SWR to well below 1.2:1. These adjustments can be made in any reasonably clear space, as long as there is a separation of five feet or more between the antenna and the nearest large object. Be sure to solder all joints and connections. Results. The front-to-back ratio of the Swiss Quad is about 25 db; its front-to-side ratio is over 35 db. In operation, a moderately strong signal from the front of the antenna will disappear off the back and sides. 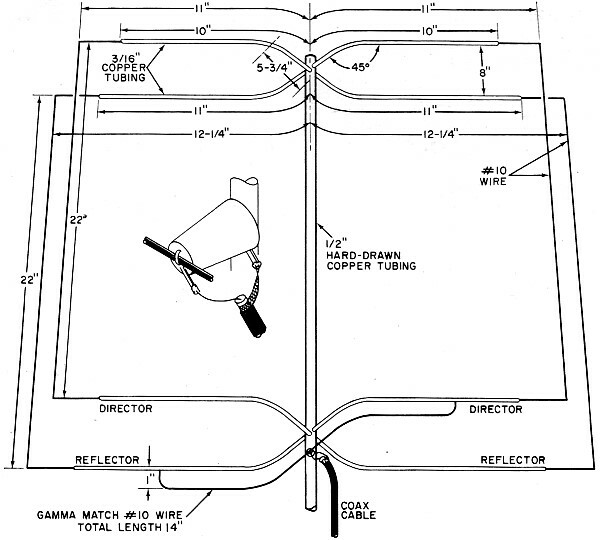 Indicated gain is a minimum of a solid 6 db over a reference dipole antenna. For its size and cost, the "Swiss Quad" is an excellent performer. By the way, it radiates a horizontally polarized signal.